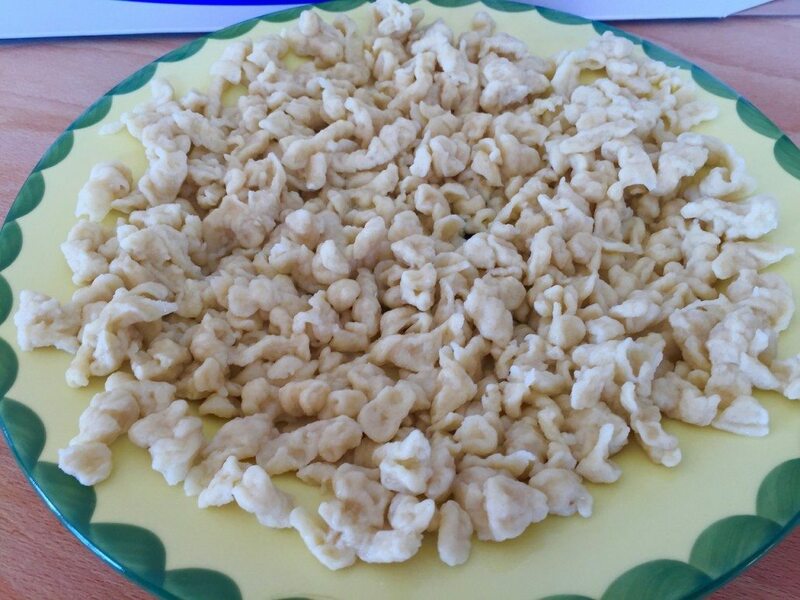 German Homemade Spaetzle, an Original. 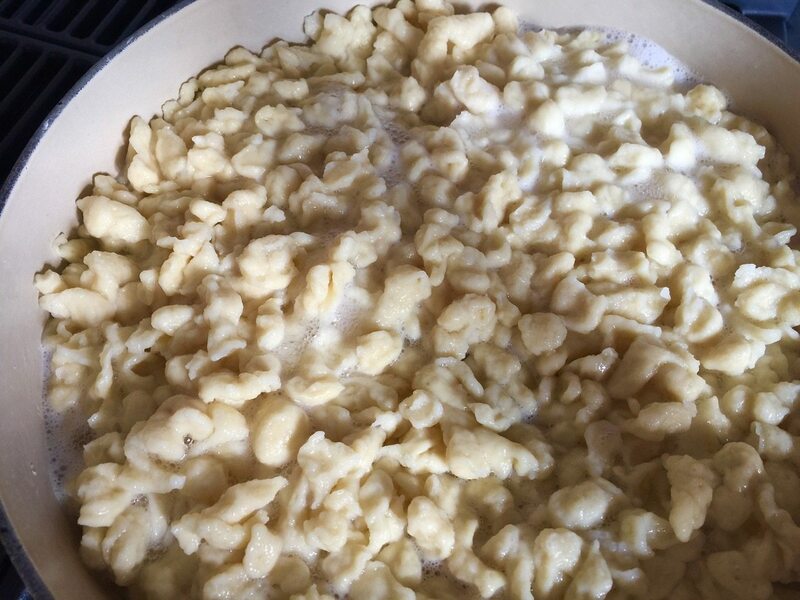 All it takes to make German Homemade Spaetzle is a little practice. Once you have done it a few times, it is fairly easy. 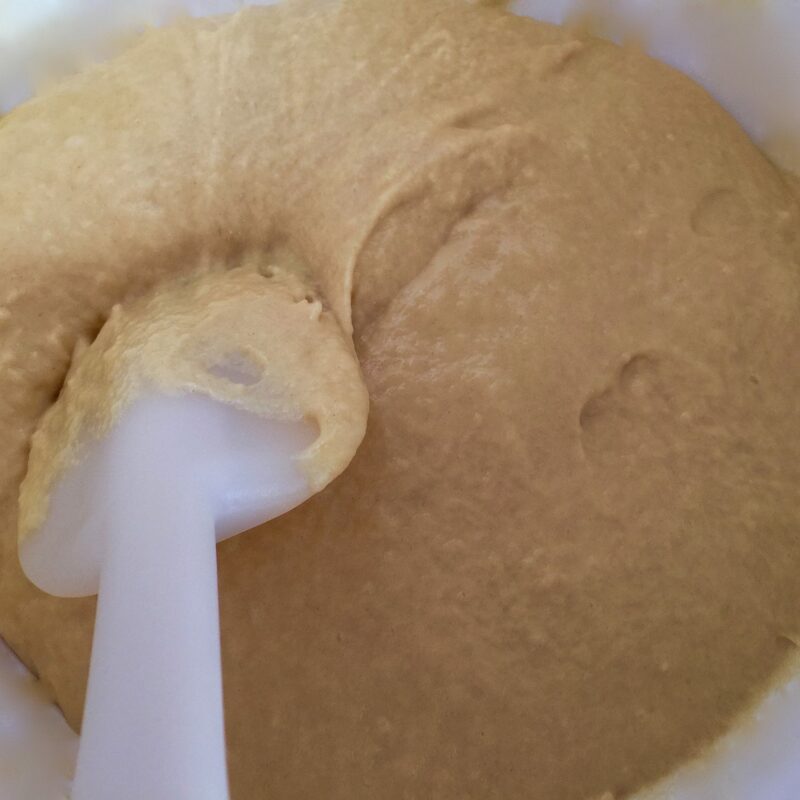 The key is to recognize the right consistency of the dough and knowing which tools to use. Spaetzle can be made in three different ways. 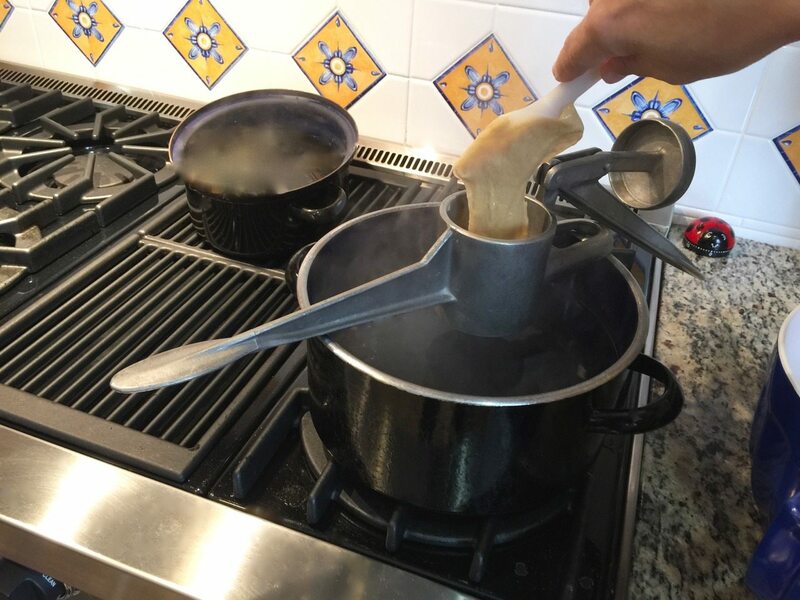 You can use a paddle board with a specially shaped steelscraper/sharpner, a sliding spaetzle maker which is the easiest way (you can purchase it in the States by just clicking the link) or a potato ricer (potato press, also available in the United States). I mostly use the potato ricer. 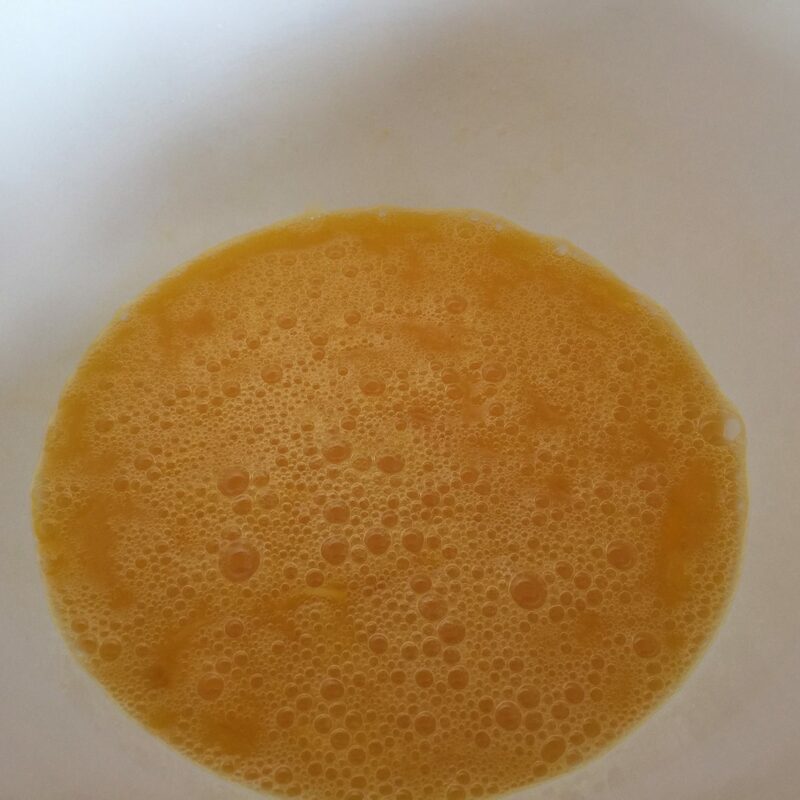 Place eggs and salt in a bowl and beat together (if you use smaller eggs you need a little less flour). Add in the flour and mix until the dough is smooth. The dough has to be elastic like chewing gum. You should see some blisters in the dough. Bring a big pot of water with about 1 teaspoon of salt to a boil. 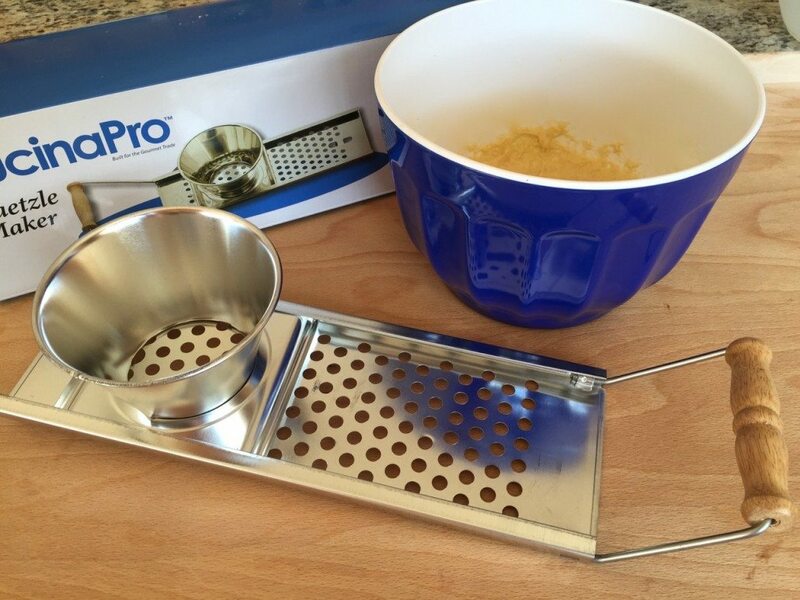 Take your potato ricer and submerge it in the water to get it wet. 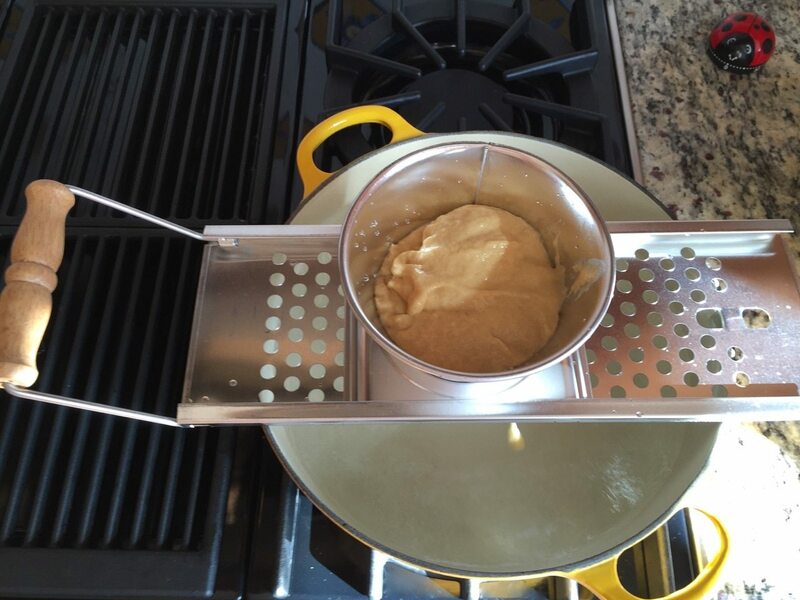 Open the potato ricer and fill it a little more than half full with dough. 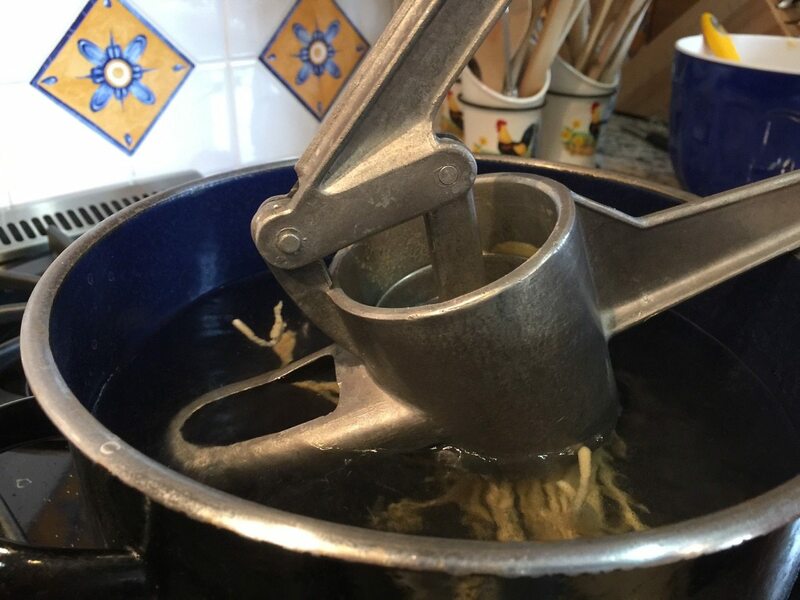 While dipping the ricer into the water press the Spaetzle dough into the boiling water about 2–3 inches long. If the dough sticks to the ricer when you take it out of the water, just scrape off the bottom with a knife. 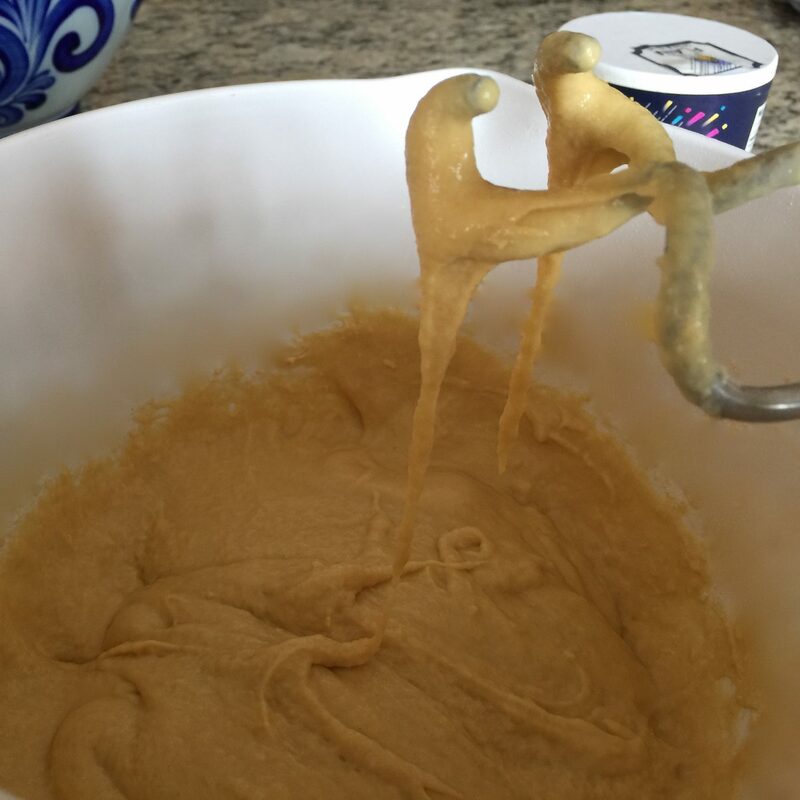 Repeat the process until you have used all the dough. 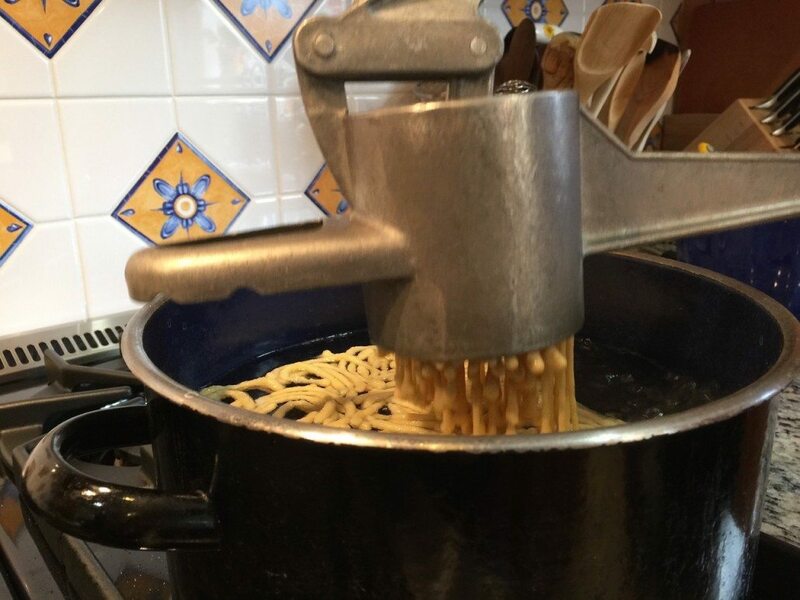 Turn the heat down and let the Spaetzle simmer until it rises to the surface. It usually takes about 5 minutes. Do not forget to stir the Spaetzle, so that it does not stick together. 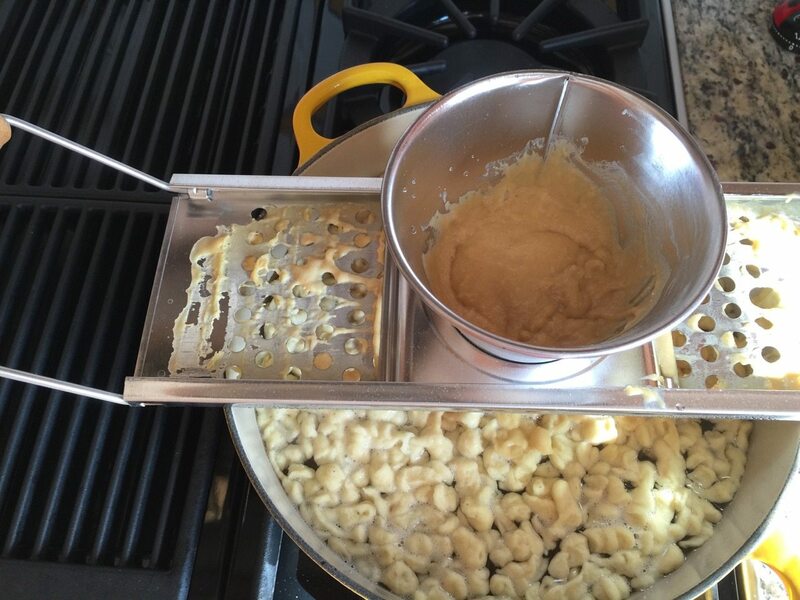 Make sure your pot is large enough to allow the spaetzle the space to move (swim) in the water. If in doubt, use two pots. 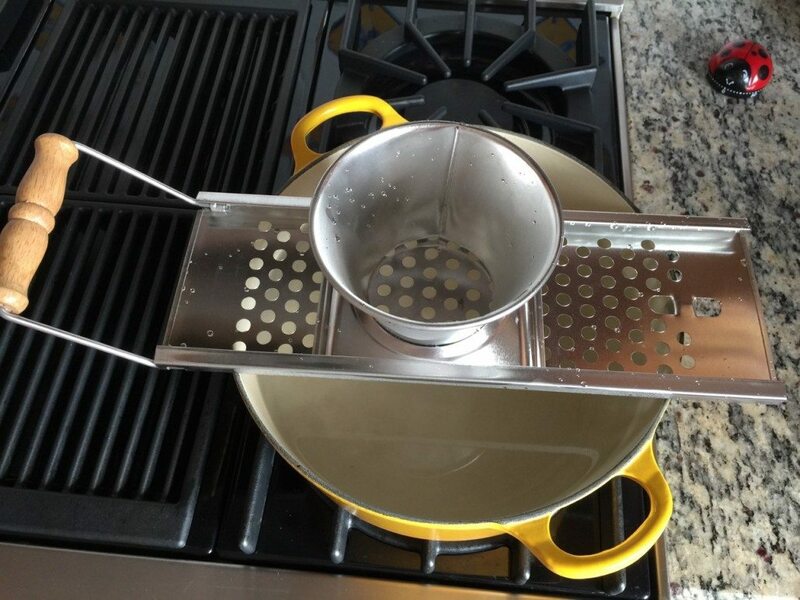 Place the cooked German Homemade Spaetzle in a colander and rinse with cold water. Butter a heat-resistant form (bakeware) and add in the Spaetzle. Spread about a tablespoon of butter on the top. Cover and heat it up for about 5 minutes in the microwave. Loosen the Spaetzle with a fork and you are all done. You can easily prepare the spaetzle ahead of time and keep it in the refrigerator until you need it. It will keep a couple of days in the refrigerator. Before serving just warm it up in the microwave. Note: If the Spaetzle has been stored in the fridge, your microwave cooking time should be about 10-15 minutes. This German Homemade Spaetzle side dish is a delicious complement to Oma’s Goulash, a beef stew your whole family is sure to love. Try it! https://www.theomaway.com/wp-content/uploads/2015/11/IMG_9539.jpg 615 1500 Oma https://www.theomaway.com/wp-content/uploads/2017/02/Oma-Logo-Authentic-German-Recipes.png Oma2015-11-24 04:00:122017-05-02 07:13:14German Homemade Spaetzle, an Original.